Optimal outcomes of a cataract surgery largely depend on the successful performance of an anterior capsulotomy. It is one of the most important steps of modern cataract surgery which reduces the risk of capsular tears and ensures postoperative stable intraocular lens (IOL). Anterior capsulotomy is considered ideal if it is round, continuous, well-centered, and overlaps the implanted IOL around its circumference. If any of these features is missing, it can be a cause of impedance for desired surgical and visual outcomes. 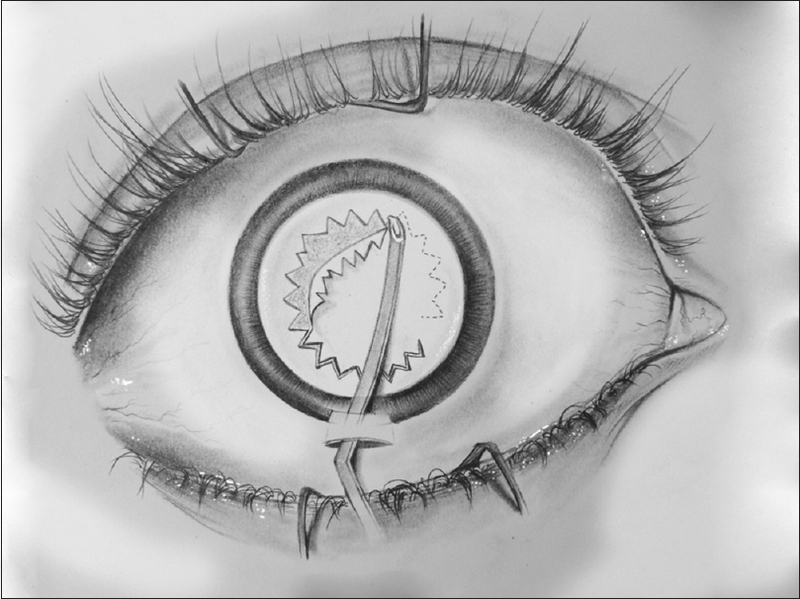 Manual can opener and manual capsulorhexis are the routine standard techniques employed for manual extracapsular cataract extraction and phacoemulsification, respectively. Recent increasing use of femtosecond laser cataract surgery has allowed cataract surgeons to obviate inherent inaccuracies of manual anterior capsulotomy techniques. 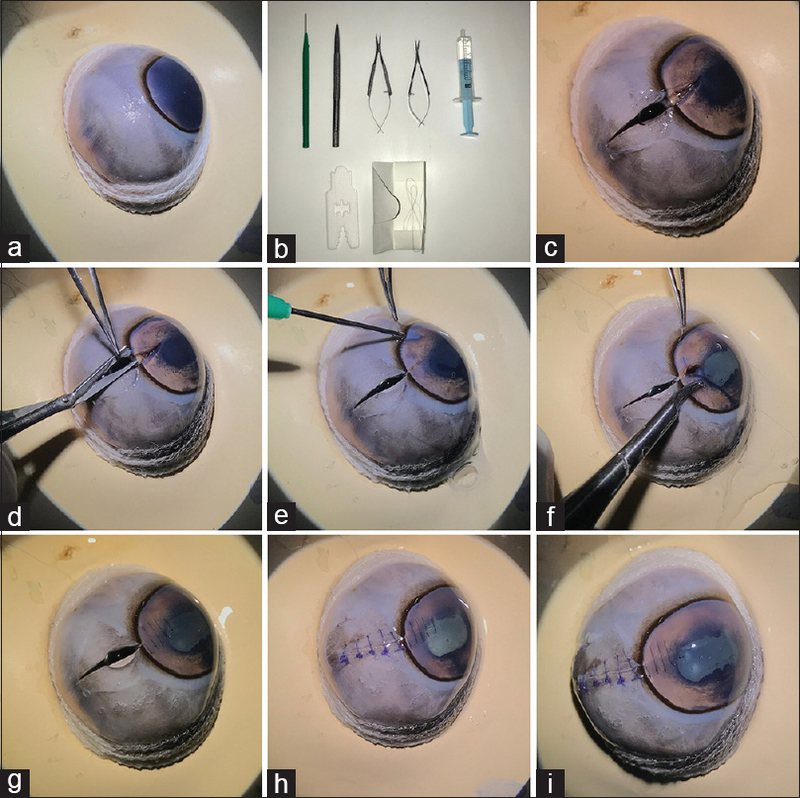 There is an ongoing quest to find an ideal, risk free, and surgeon-friendly technique of anterior capsulotomy that can be employed for surgery in all types of cataracts. Purpose: To compare the efficacy and safety profile of oral azithromycin with that of doxycycline over 9 months in patients experiencing failure with conservative and topical treatment for Meibomian gland dysfunction (MGD), to assess recurrence of MGD, and to determine the number of treatments required. Methods: This is a randomized controlled trial with a cross-over design at a tertiary care center. 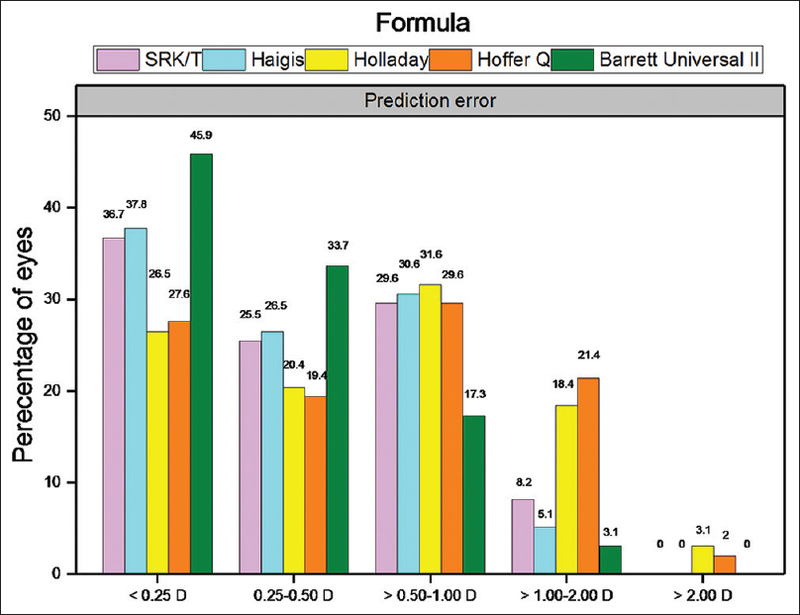 In all, 115 consecutive patients underwent a complete ophthalmological examination before being randomly assigned to oral treatment with doxycline (4 g for 30 days) or azithromycin (1.25 g for 5 days). Patients were evaluated at 3, 6, and 9 months. Therapy was switched or conservative management maintained according to signs and symptoms. Results: In the azithromycin group, 83.25% of the patients were stable after one treatment, 16.5% needed a further one or two treatments (some had previously been switched to doxycycline), and 5.77% did not improve despite treatment. In the doxycycline group, 33.79% of patients were stable after one treatment, 66.21% needed a further one or two treatments (some had previously switched to azithromycin), and 29.41% did not improve despite treatment (P < 0.05). Minimal gastrointestinal adverse effects (nausea, diarrhea, abdominal cramp, and decreased appetite) were reported, mostly unchanged at the follow-up visits. At the first visit, more adverse effects were reported in the doxycycline group (14/51, 24%) than in the azithromycin group (3/52, 6%; P < 0.005). Conclusion: Both antibiotics were effective and safe for treating patients with persistent MGD, although azithromycin was superior when the reduced dose and the shorter course of therapy (5 days vs. 4 weeks) were taken into consideration. Given the chronic nature of the disease and the improvement in some signs with minimal adverse effects, a shorter therapy seems a safer and more logical alternative to longer regimens. Purpose: To report the prevalence and risk factors of cataract and its subtypes in older age group. Methods: A total of 6617 subjects were recruited from both rural and urban areas. A detailed history including data on demographic, socioeconomic and ocular history was obtained. 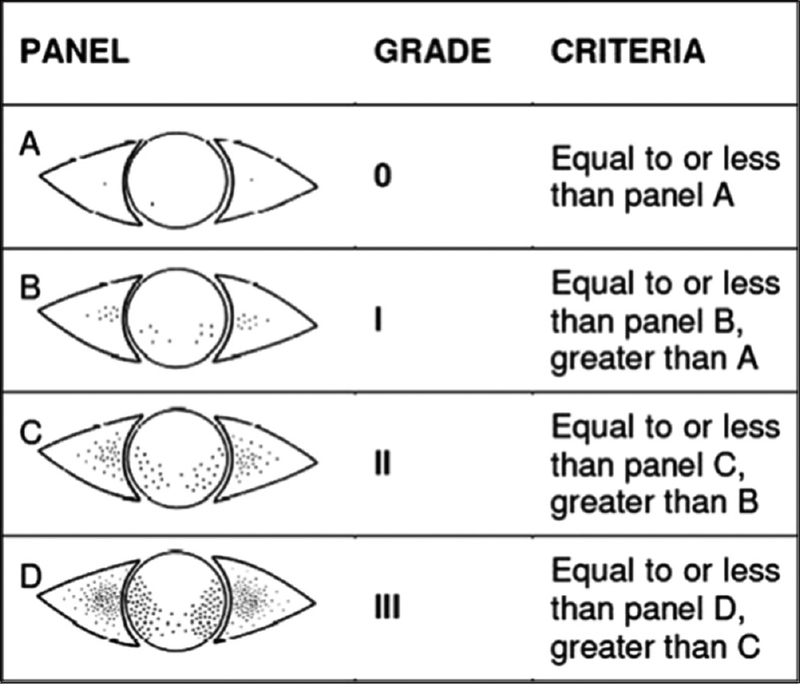 Lens opacity was graded according to the Lens Opacity Classification System III (LOCS III). Results: Cataract was present in 1094 of the rural and 649 subjects in the urban population. Monotype subtype cataracts were found in 32% and 25% in rural and urban population and 12.68% and 18.6% were mixed cataracts in the rural and urban groups. In baseline characteristics history of diabetes, alcohol intake and presence of age-related macular degeneration were the risk factors in urban group. On multivariate analysis, the only significant risk factors for any cataract in subjects ≥60 years were increasing age in both rural [odds ratio (OR), 1.07] and urban (OR, 1.08) population, and HbA1c (OR, 1.14) in rural population. Overweight (OR, 0.6) was found to be a protective factor, and lower social economic status (OR, 1.52) a risk factor for cataract in urban population. A significant urban–rural difference was found in the prevalence of cataract and its subtypes (P ≤ 0.05). Conclusion: We found the risk factors for any cataract in older age group to be increasing age and HbA1c in rural group. Age and lower social economic status were found to be the risk factors in urban arm. A statistically significant difference was found on comparison of the prevalence of cataract and its subtypes between the rural and urban population. Purpose: To evaluate the long-term outcomes of cataract surgery in children with uveitis. Methods: Retrospective, noncomparative review of medical records of children (≤16 years) with uveitic cataract who had undergone cataract surgery between January 2001 and December 2014 at a tertiary care center was done. 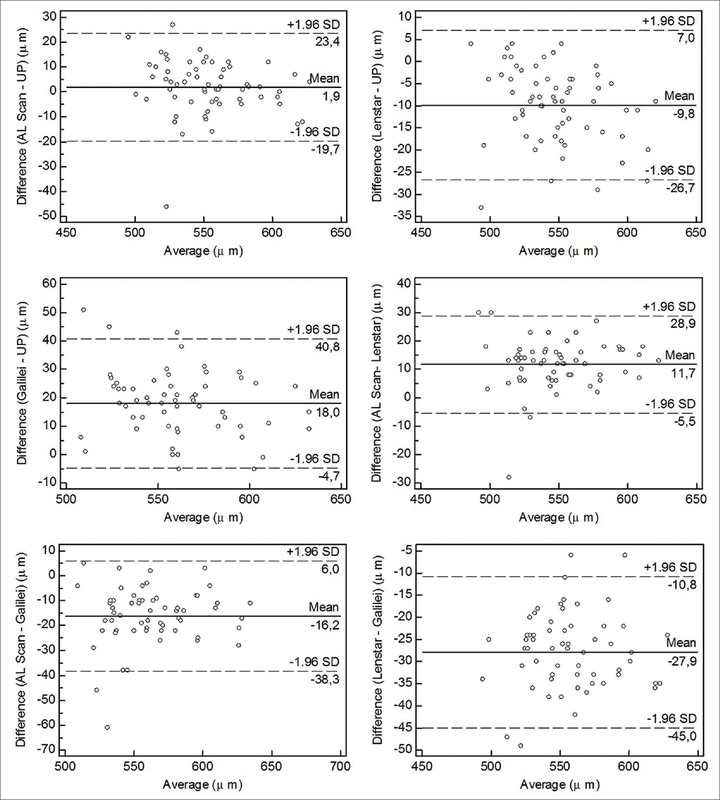 The main outcome measures were visual acuity and postoperative complications. Results: We recruited 37 children (58 eyes) who were diagnosed with uveitic cataract and underwent cataract surgery. The etiology of uveitis included juvenile idiopathic arthritis (n = 19), presumed intraocular tuberculosis (n = 8), idiopathic (n = 4), Behçet's disease (n = 2), Vogt–Koyanagi–Harada syndrome (n = 2), human leukocyte antigen B-27 associated uveitis (n = 1), and toxocariasis (n = 1). 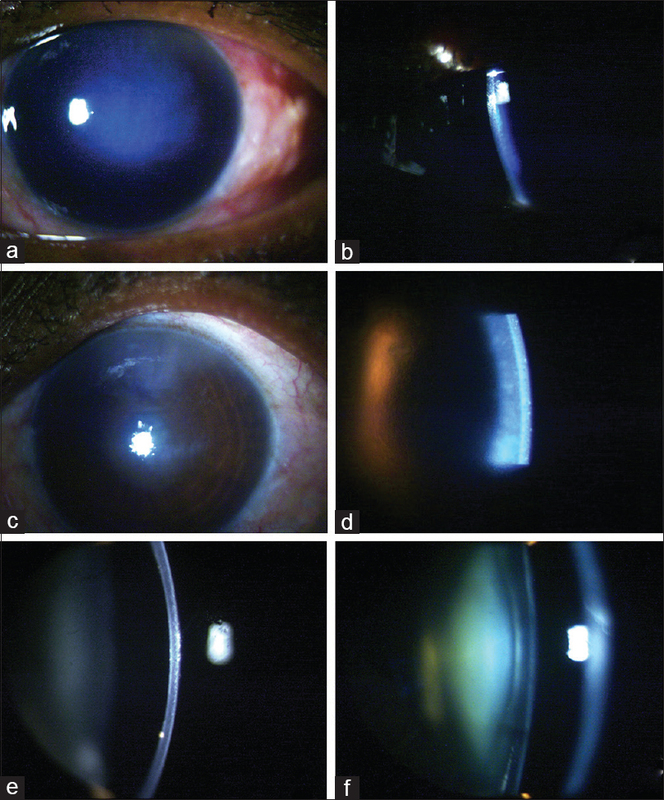 Phacoemulsification with intraocular lens (IOL) implantation was performed in 17 patients (27 eyes; 46.55%), while 20 patients (31 eyes; 53.44%) were left aphakic after pars plan lensectomy and vitrectomy. 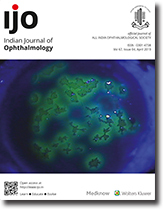 At an average follow-up of 3.69 ± 7.2 (SD) years, all cases had significant improvement in corrected distance visual acuity post cataract extraction; visual acuity of 20/40 or more was achieved in 32 eyes (55.17%). The most common complication was capsular opacification (37.93%). Incidence of secondary procedures as well as glaucoma was not statistically different in patients undergoing IOL implantation from those who were aphakic. Conclusion: Even though number of secondary procedures was more in pseudophakic group, meticulous choice of surgical technique and adequate immunosuppression lead to a modest gain of visual acuity in children undergoing IOL implantation in uveitis. However, scrupulous case selection and aggressive control of pre- and postoperative intraocular inflammation are the key factors in the postoperative success of these patients. 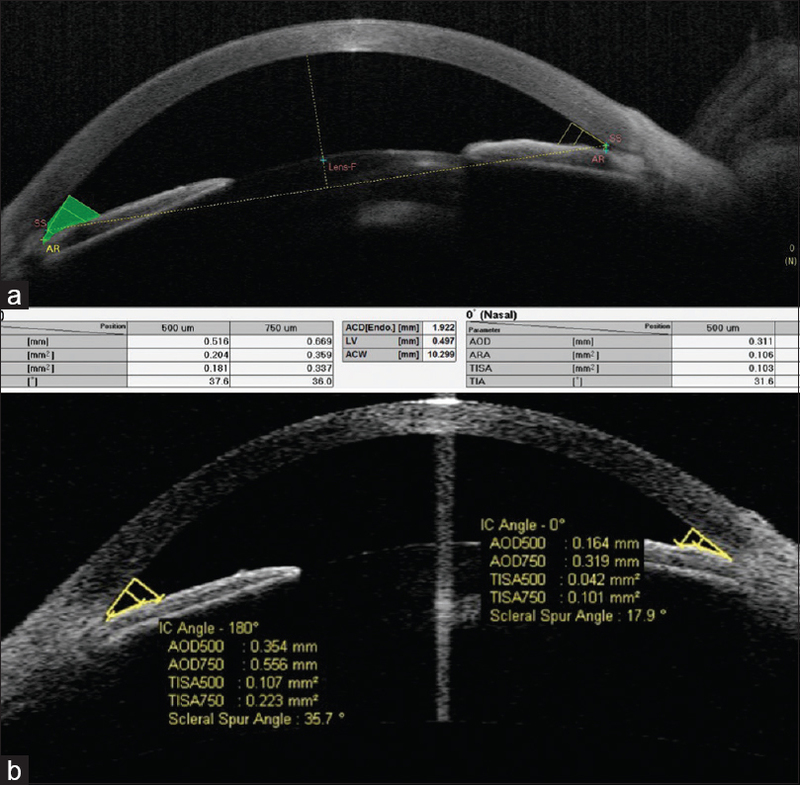 Purpose: To determine the comparability of anterior chamber biometric measurements in primary angle closure disease (PACD) patients using two commercially available anterior segment optical coherence tomography machines (ASOCT): Visante and Casia. Methods: This was a cross-sectional observational study, which included clinically, diagnosed cases of PACD. Anterior segment biometric measurements were done using Casia and Visante ASOCT. Parameters studied were central corneal thickness (CCT), anterior chamber depth (ACD), nasal (N) and temporal (T) angle opening distance at 500 μm (AOD500) and 750 μm (AOD750), and N and T trabecular iris space area at 500 μm (TISA500) and 750 μm (TISA750). Results: Total 36 PACD patients (72 eyes) with average age of 59.48 ± 7.95 years were recruited, out of which 25 were females (69.44%) and 11 males (30.56%). 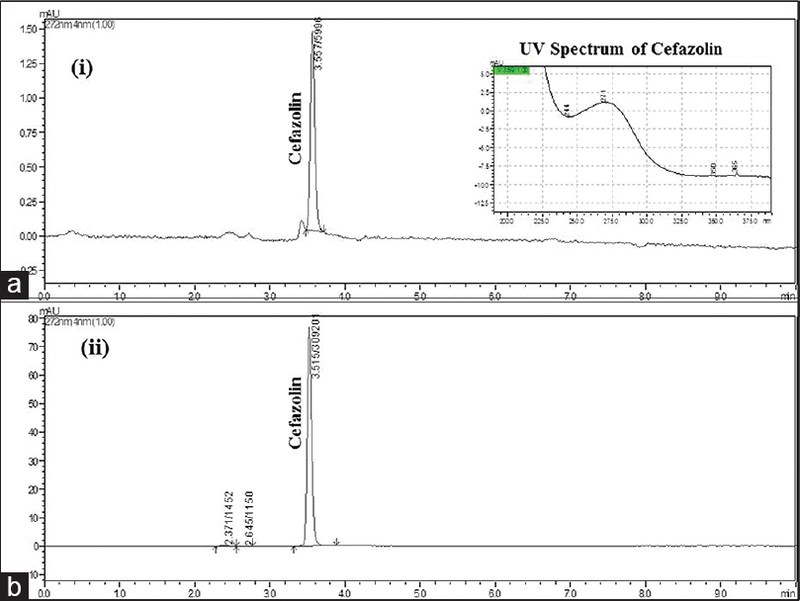 The mean measurements of CCT, ACD, AOD500, and TISA on Casia and Visante machines were 522.5 ± 34.75 μm and 539.55 ± 29.56 μm (P = 0.00); ACD- 2.144 ± 0.38 mm and 2.133 ± 0.39 mm (P = 0.487); AOD500-0.27 ± 0.16 μm and 0.21 ± 0.10 μm (P = 0.04); and TISA500-0.100 ± 0.07 μm and 0.063 ± 0.03 μm (P = 0.00), respectively. A statistically significant difference was noted in CCT, N and T AOD, and TISA. A good corelation for ACD and CCT (ACD = 0.9816 and CCT = 0.772) only were noted between the two machines. The Bland-Altman plot analysis of different parameters between two machines has revealed good agreement of measurement of ACD and CCT but poor agreement for rest of the parameters. Conclusion: It is advisable not use the two machines interchangeably because of the wide limits of agreement and poor correlation of angle measurement values of Casia and Visante ASOCT. 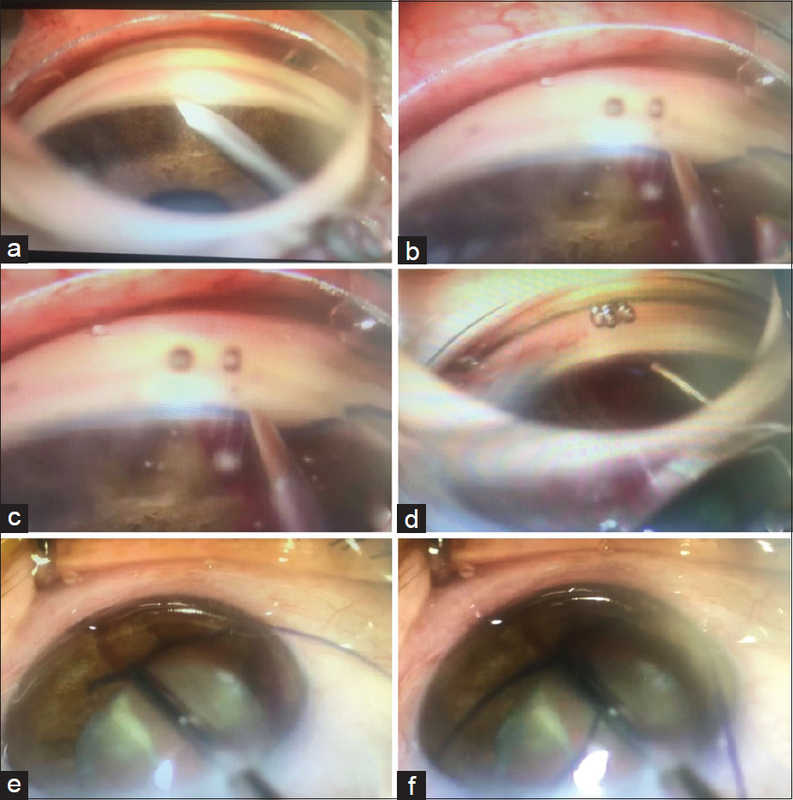 Purpose: To evaluate the success, safety, and complication rates of gonioscopy-assisted transluminal trabeculotomy (GATT) combined with cataract surgery. 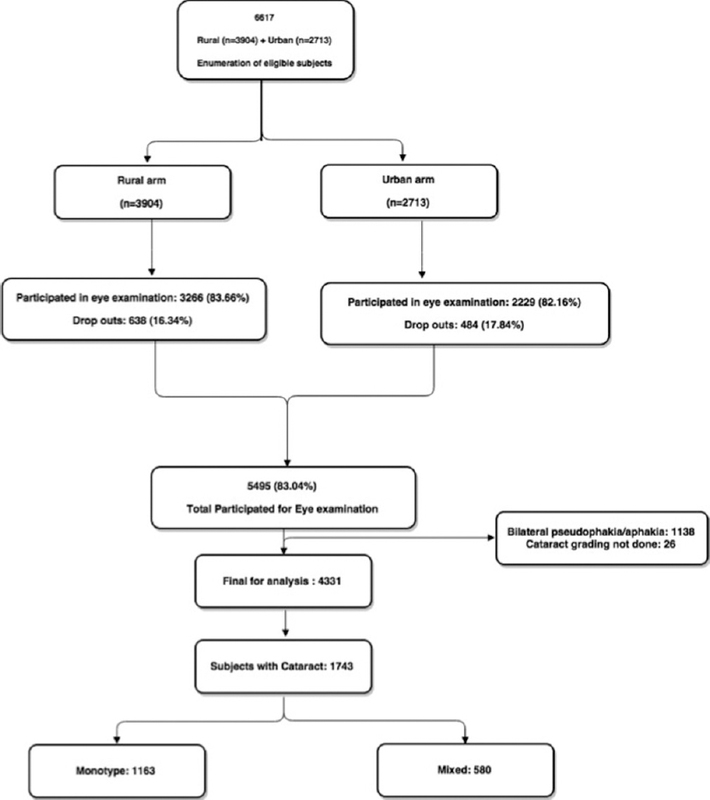 Methods: A retrospective study was conducted for 32 patients who underwent GATT combined with phacoemulsification and intraocular lens implantation. Patients with primary open-angle glaucoma were enrolled. The primary outcome measures were visual acuity, intraocular pressure (IOP), the number of antiglaucoma medications used, and complications. Results: The average preoperative visual acuity of the patients was logMAR 1.57 ± 1.2, and the average postoperative visual acuity was logMAR 0.39 ± 0.38. 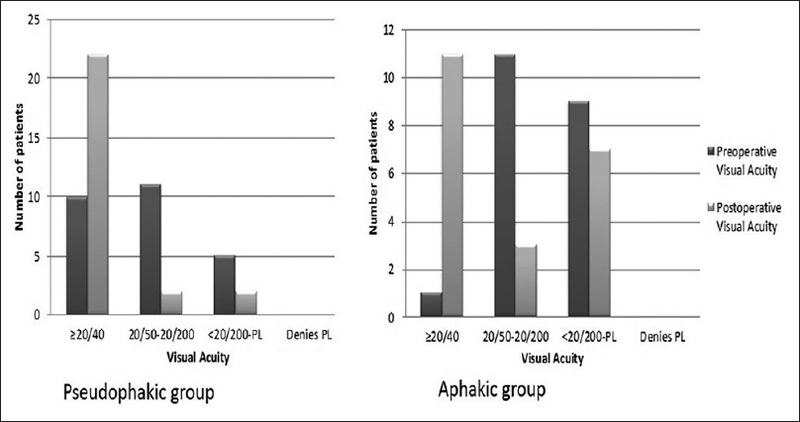 A significant increase in visual acuity was observed post-surgery (P < 0.05). The average preoperative IOP was 34.2 ± 10.6 mmHg. In the 3rd postoperative month, the average IOP was 10.5 ± 2.2 mmHg, and in the 6th postoperative month, the average IOP was 11.2 ± 2.4 mmHg. In all postoperative follow-ups, IOP was significantly lower than that during the preoperative period (P < 0.05). A decrease of 2.7 ± 0.6 on average was detected in the number of glaucoma medications used in the postoperative period compared to the preoperative period, and the average decrease in the number of active ingredients post-surgery was 3.5 ± 0.8. The most frequent complication was hyphaema (31.2%). In only one patient (3.1%), the surgery was considered to have failed due to the development of deep hypotony. Conclusion: Performing GATT in the same session as cataract surgery does not reduce the efficacy of GATT, yet this procedure reduces the incidence of the most frequent complication of GATT, i.e. hyphaema. Therefore, in convenient cases, combined surgery can safely be performed. Purpose: To report the incidence, modes of injury, treatment, and short-term outcomes in eyes with post-traumatic elevated intraocular pressure (IOP). 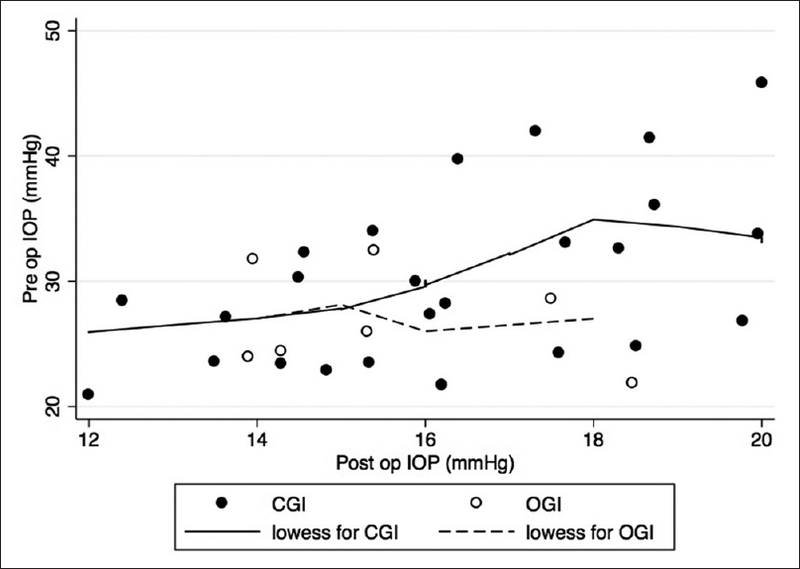 Methods: This was a 5-year hospital-based retrospective study of children ≤16 years who presented with open (OGI) or closed globe injury (CGI) and developed elevated IOP >21 mmHg. Those with a minimum follow up of 3 months were included. Analysis of various parameters such as influence of demographics, mode of injury, IOP, best-corrected visual acuity (BCVA), and effect of medical and surgical treatment on IOP and BCVA was done. Results: Out of 205 pediatric eyes with ocular trauma, 121 (59%) had CGI and the remaining 84 (41%) had OGI. Thirty-two eyes (15.6%) developed elevated IOP. The incidence of elevated IOP following CGI [25 eyes (20.6%)] was significantly higher than that following OGI [7 eyes (8.3%, P = 0.02)]. Hyphema (37.5%) and lens-related mechanisms (18.75%) were the most common causes of elevated IOP. The mean IOP at the time of diagnosis was 29.8 + 6.3 mmHg and reduced to 16.2 ± 2.2 mmHg at last follow up (P < 0.001). Surgical management was required in 12 eyes (37%) and significantly more eyes with CGI required trabeculectomy (24% in CGI vs. 0% in OGI, P = 0.03). Poor baseline vision and vitreoretinal involvement [0.67 line decrement, 95% confidence interval (CI) =0.1–1.25 lines, P = 0.025] increased risk of poor visual outcome. Conclusion: Post-traumatic IOP elevation occurred in 15% pediatric eyes, was more common with CGI compared to OGI and nearly one-fourth of eyes with CGI required glaucoma filtering surgery for IOP control. Overall, medical management was needed in 63% eyes and 37% required surgical management. Visual acuity was poor in eyes with OGI due to posterior segment involvement. 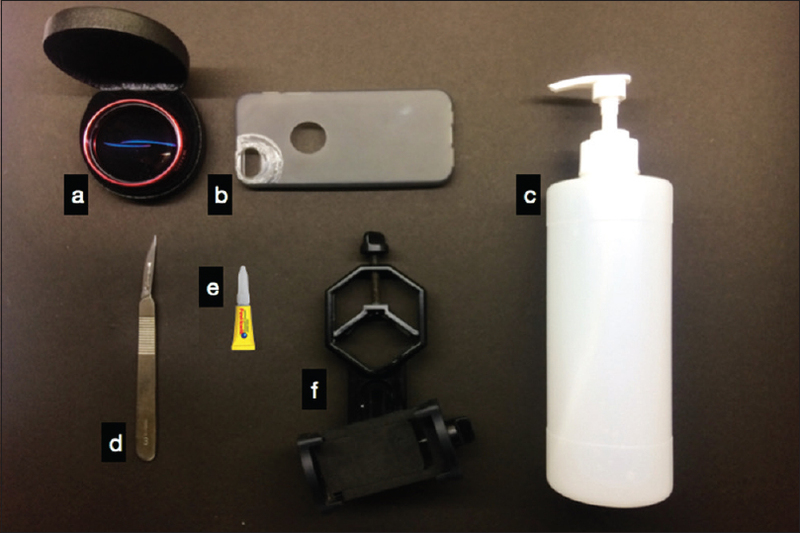 Purpose: This study aimed to investigate the efficacy of cyclophotocoagulation with an illuminated laser probe under a noncontact wide-angle retinoscope in treating refractory glaucoma. 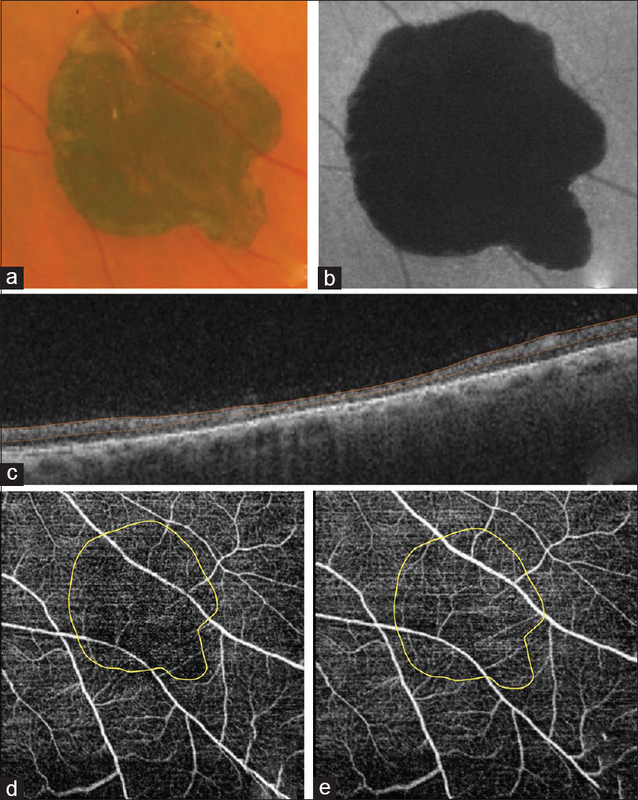 Methods: Eleven patients (11 eyes) with refractory neovascular glaucoma were treated with ciliary body photocoagulation. Preoperative and postoperative corrected visual acuity, intraocular pressure (IOP), ophthalmofundoscopy, B-ultrasound and ultrasound biomicroscopy, optical coherence tomography, and fundus fluorescein angiography were performed. Results: Preoperative IOP ranged from 45 to 58 mmHg (mean 51.9 mmHg). At postoperative 1, 3, and 6 months, the IOPs ranged between 16 and 33 mmHg (mean 27.1 mmHg), 14–28 mmHg (mean 20.6 mmHg), and 14–28 mmHg (mean 18.5 mmHg), respectively. IOP at the last follow-up (range 7–12 months) was 15–24 mmHg (mean 18.8 mmHg). An average of 63.8% decrease in postoperative IOP was found in these patients with no associated complications. 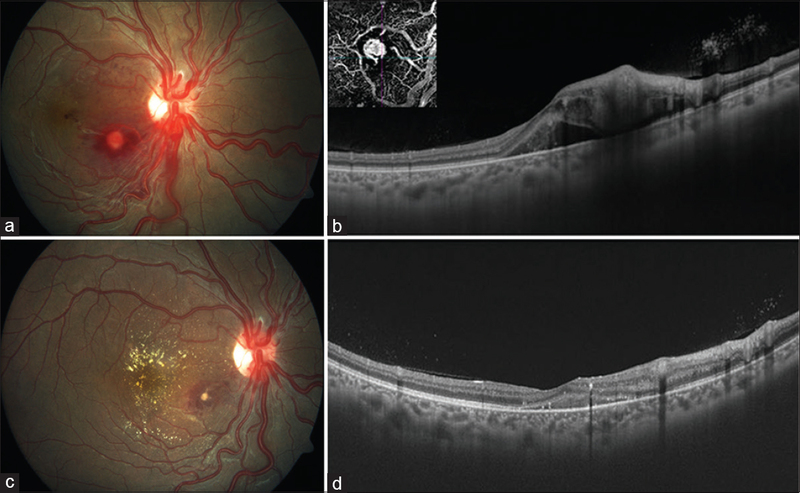 The postoperative fibrotic exudate, anterior chamber hyphema, and exudative choroidal detachment were all well-managed and resolved. No patients experienced intraocular lens deviation or dislocation, hypotonia oculi, atrophy of eyeball, retinal detachment, endophthalmitis, or sympathetic ophthalmia. 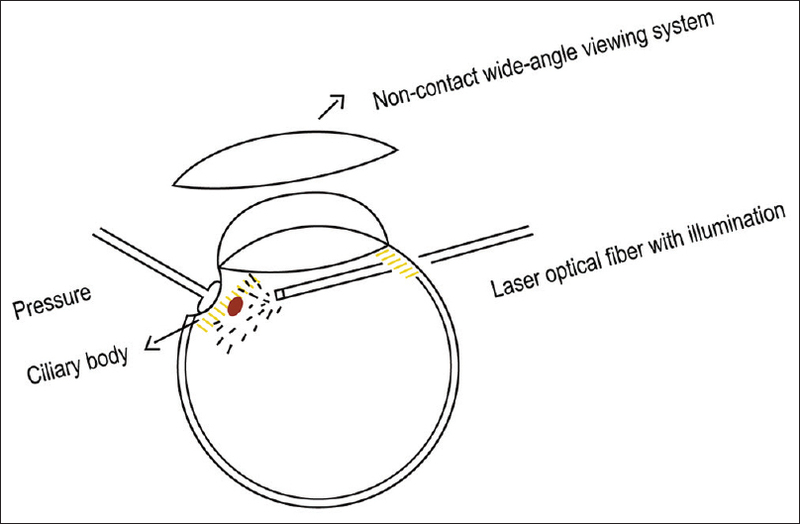 Conclusion: Cyclophotocoagulation with an illuminated laser probe under a noncontact wide-angle retinoscope is a safe and effective technique for the treatment of neovascular glaucoma. 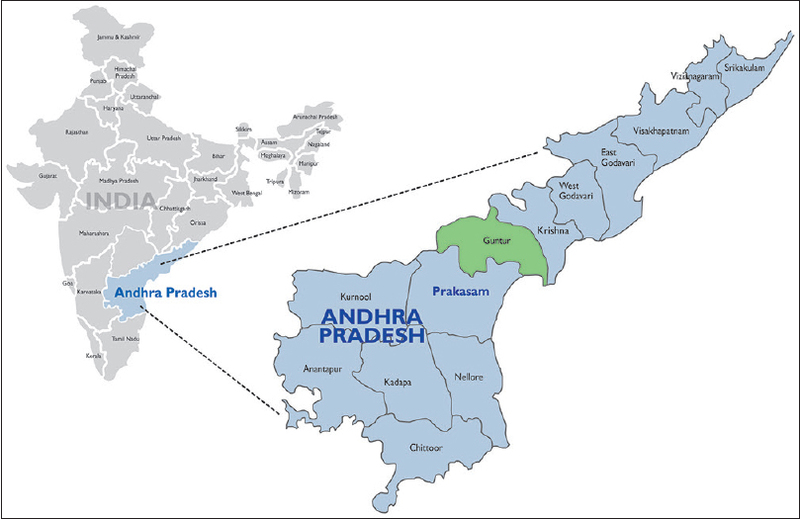 Purpose: To estimate the prevalence, causes, and risk factors for visual impairment (VI) among children of school for hearing-impaired (HI) in Guntur district of Andhra Pradesh, India. 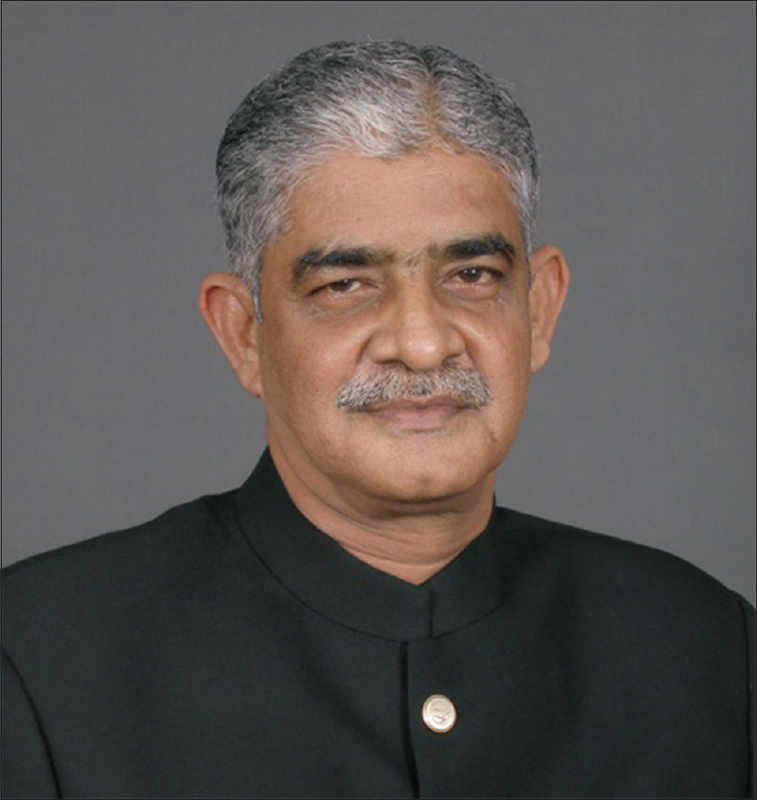 Methods: Children between 6 and 16 years of age available in all the 12 special schools for HI were examined. Visual acuity (VA) testing, ocular motility, and examination of anterior and posterior segment for all children were done. 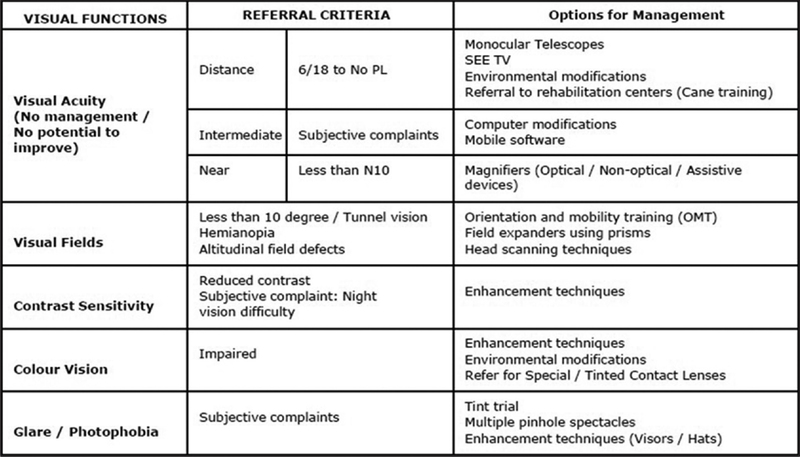 Those having VA of less than 6/12 in better eye underwent cycloplegic refraction. For definition of VI, as per World Health Organization (WHO), VA of better eye was considered. HI was also classified as mild, moderate, severe, and profound as per WHO definitions. Examination for systemic diseases and other associated disabilities was also done. Results: In all, 402 children underwent examination. Ophthalmic abnormality was seen in 64 children with a prevalence of 15.9% [95% confidence interval (CI) 14.9%–16.8%], and VI was seen in 29 children with a prevalence of 7.2% (95% CI 4.9%–10.2%). 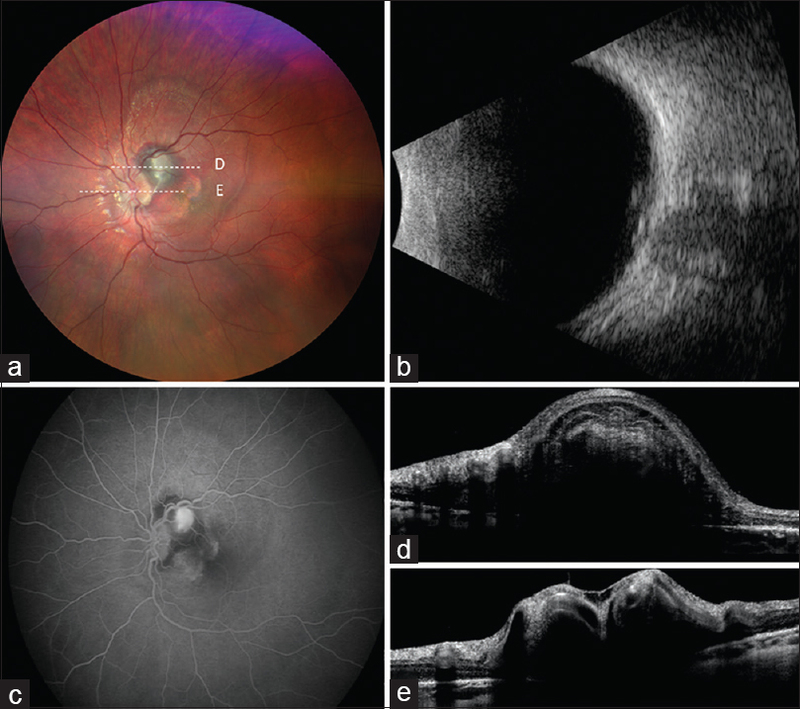 Refractive errors [29 (7.2%)], retinitis pigmentosa (RP) [16 (4%)], and squint [8 (2%)] were the major ophthalmic abnormalities. Thirty-five (54.7%) of the abnormalities were either preventable or treatable. The major cause of VI was refractive error (18) followed by RP (5). Twenty of them (69%) with VI in this study group were treatable. Twenty-two (75.9%) children with eye problem were newly diagnosed. The only risk factor for VI was being mentally challenged (odds ratio: 5.63; 95% CI: 1.89–16.8). Conclusion: The prevalence of ophthalmic abnormalities and VI in school for HI was high, and the majority of them were not detected so far. As most of them are easily treatable, it is highly recommended to conduct regular eye examinations in these schools. Purpose: Visual impairment is a major health concern all over the world. Globally, it has been studied that utilization of low vision care (LVC) services varies from 3% to 15%. This study describes barriers to access the LVC services and suggest enablers to improve the uptake of services in a tertiary eye care hospital. Methods: A snapshot qualitative research design with purposive sampling was adopted. Qualitative part of the study involved 13 eye care practitioners (ECPs) and 7 patients with low vision participated in one to one in-depth interviews. The interviews were audio recorded, transcribed, inductively coded, and analyzed. The barriers to access LVC services were identified and enablers to improve the uptake of services were implemented. The referral rate and utilization of LVC services were analyzed in the quantitative part. Results: Themes emerged out of qualitative part of the study were barriers, perceived benefits, and enablers to improve the uptake of LVC services. Barriers among ECPs included lack of awareness on referral criteria and available LVC. Barriers among patients were lack of knowledge and understanding about the need for services. The enablers included development of referral criteria and referral pathway to LVC services, creating awareness of LVC services to patients and ECPs, stratification levels of LVC services, and implementation of LVC counseling chamber. Referral rate improved from 25.6% to 51.2% and the utilization of services increased from 67.9% to 81.7% after implementation of the recommended enablers. Conclusion: Execution of stratified enablers increased the uptake of LVC services benefiting more number of people with low vision in this study. Corticosteroids are known to cause many ocular and systemic side effects when administered by oral or parenteral routes. Corticosteroid induced systemic toxicity secondary to topical steroid eye drops is rare. A 6-week-old, male infant was brought to our tertiary eye care center with bilateral congenital cataracts. The child underwent phacoaspiration with primary posterior capsulotomy without intraocular lens implantation in both eyes at an interval of 6 weeks. Child was initiated on topical betamethsone 0.1% eight times a day, tobramycin 0.3% six times a day, homatropine 2% twice a day, and carboxymethylcellulose 0.5% four times a day. Two and four weeks later he underwent surgical membranectomy in the right and left eye respectively followed by frequent use of topical steroids, initially given 1 hourly and then tapered weekly in the follow-up period. The patient showed increase in intraocular pressure and gain in body weight along with development of cushingoid habitus nearly 6 to 8 weeks after starting topical steroids. These side effects started weaning off following the reduction in dose of topical steroids, suggesting the role of the corticosteroid-related systemic side effects. 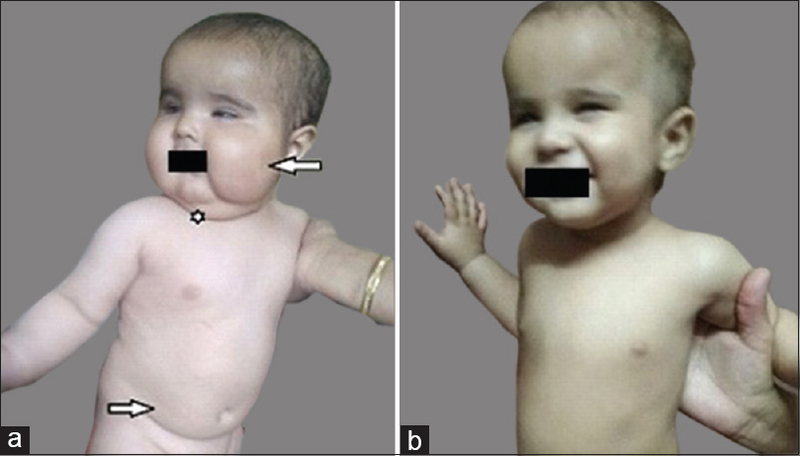 This case highlights the serious systemic side effects secondary to increased frequency and duration of topical corticosteroid use in infancy. Hence, dosage of topical steroids should be adjusted in its therapeutic range to prevent their ocular and systemic side effects. Therefore, close monitoring is advocated for children using topical corticosteroids to prevent serious ocular and systemic side effects. 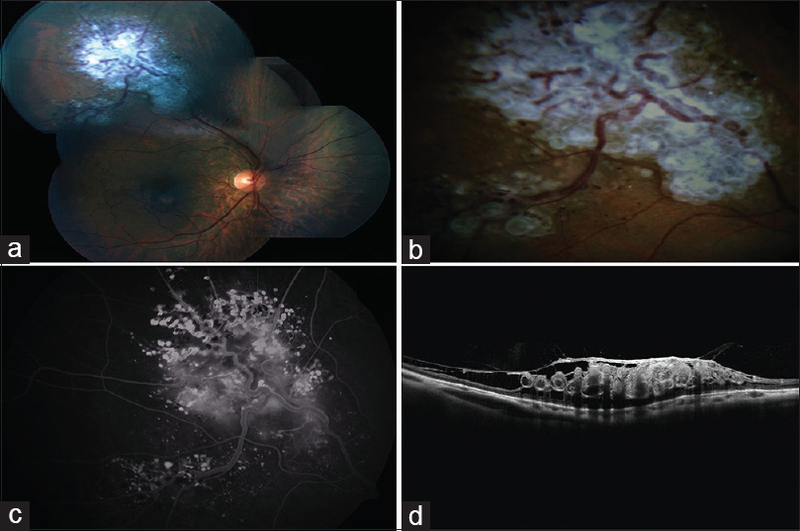 Retinal cavernous hemangiomas is a rare vascular tumor, isolated and non-progressive. This tumor is incidentally diagnosed on fundus examination and visual impairment can be rare presentation from vitreous hemorrhage, pre-retinal traction, hyphema, or macular scarring. The tumor has typical appearance of grape-like clusters of dilated vascular sacs with variable surface gliosis. Characteristic imaging findings aids in diagnosis. 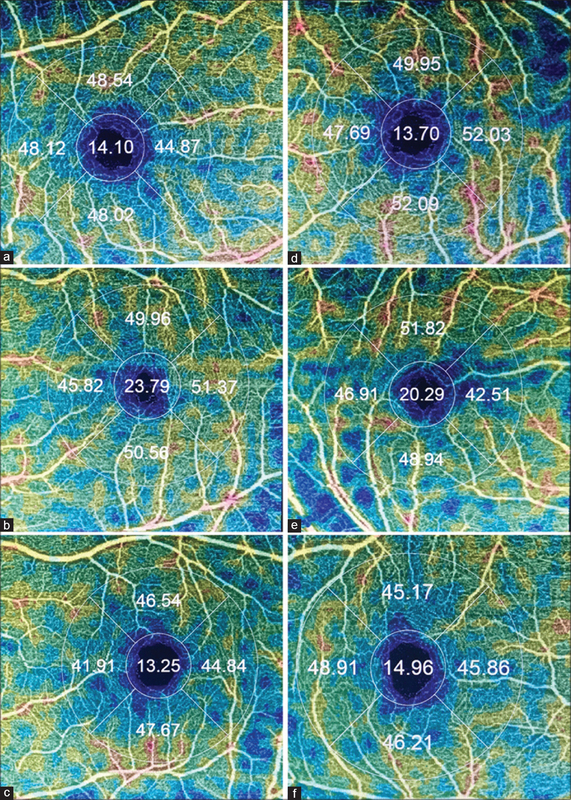 Newly emerged imaging tool is optical coherence tomography angiography (OCT A) which obtains high-resolution visualization of retinal vasculature in non-invasive fashion. 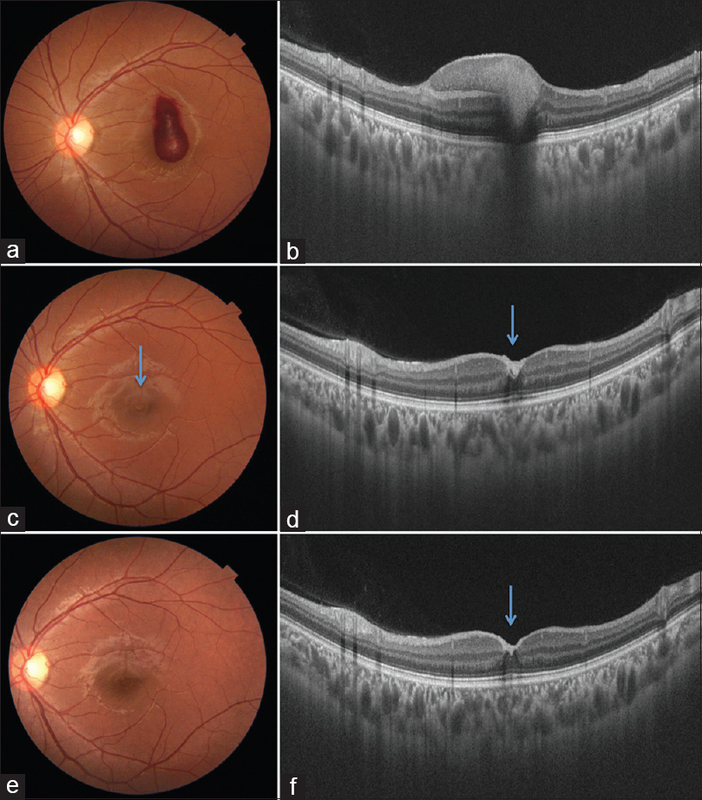 In the present case report, we analyzed various diagnostic tool available for retinal cavernous hemangiomas; illustrating on the OCT A features. An 18-year-old female presented with rapidly progressive proptosis of the left eye for one month and grade II relative afferent pupillary defect. Orbital imaging showed a well-defined homogenous extraconal mass in close relation to the lateral rectus muscle and extending up to the superior orbital fissure, associated with bony erosion. An incisional biopsy was performed, with the histopathology demonstrating stellate to spindle-shaped tumor cells (fibroblasts) embedded in a richly myxoid matrix. A diagnosis of low-grade fibromyxoid sarcoma (LGFS) was made. The patient was treated by stereotactic external beam radiotherapy. Here, we report a case of LGFS which, to the best of our knowledge, is the first at an orbital location.